Since accidentally becoming an educator, I have seen some on the supposed higher end of the scale “poo-poo” the time I have spent teaching those in more career oriented formats. The arrogance is sometimes stunning. As a part of working with less traditional students recently, I have had the opportunity to stand in front of…and learn from some recent Nepali immigrants in Akron. They are quietly polite, hard workers, and have overcome some serious language and cultural barriers to find ways to contribute to their community. 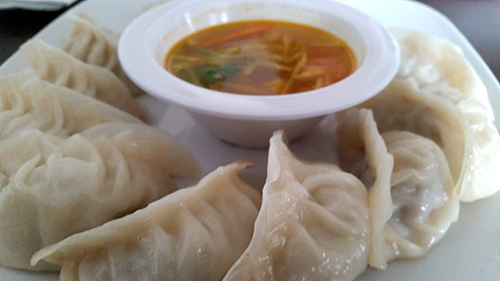 One of my Nepali students recently whispered to me (she whispers almost everything) about the Nepali Kitchen in Akron. Immigrants trying to make their place by offering a taste of their home to ours. We gave it a run and all I have to say is…"Thanks Suk! What a recommendation!" There isn’t much I envy about folks who live in big cities, but one certainly enviable thing is the access to real authentic food and people from far away. Not much of that going on around here…except for today. 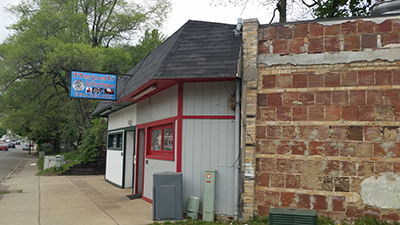 The building is unassuming, inside and out. 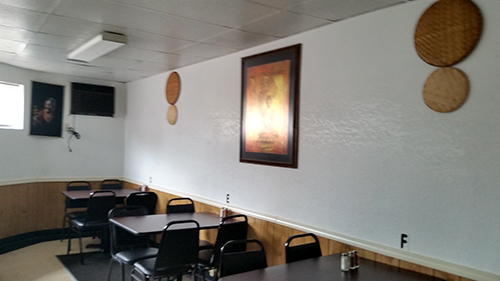 We had barely walked in the door before we were met with enthusiastic greetings from our server and the kitchen. If you can imagine the corporate greeting mandated by Moe’s Southwest Grill, but make it sincere…you would have some idea. While communication takes a bit more focus to get ideas across, it was clear they were happy to have us. Our server appeared tickled when we asked her opinion and even more so when we took her recommendation. One of the cooks came out to help with some side work and checked in a couple of times, ensuring he would gladly manipulate the heat/acid/anything to make us happy. 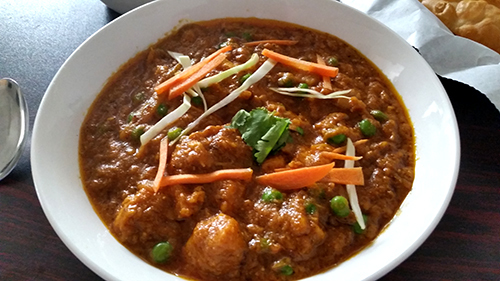 I had wanted a goat dish, which they did not have, but he assured me they usually did and we discovered why they call goat mutton, when we know it as a sheep over 2 years old. In Nepal, apparently the term applies to whether the animal forages in the mountains or on the plains, who knew? I’m definitely going back for a bowl, a taste of that far away that is unusual around here not to mention a test of kitchen skill. I’m not that familiar with Nepali cuisine, so we were essentially taking a flyer on the menu but found our hosts most helpful. When we first sat the greatest hits of Suresh Kumar were playing on Vevo but when the album finished they changed to the channel playing Maroon 5, then Bruno Mars, then Tay-Tay. I kinda wished they had restarted the original (especially when it devolved to the Swift)…but I think they probably changed it for us. A mixed platter of appetizers, bread and two meals arrived. The mixed platter combines the first five appetizers and started us in a great direction. If I had to pick on anything at all during our stay the chicken pakora (battered and deep fried chicken) was delicious but had been fried close to jerky consistency. 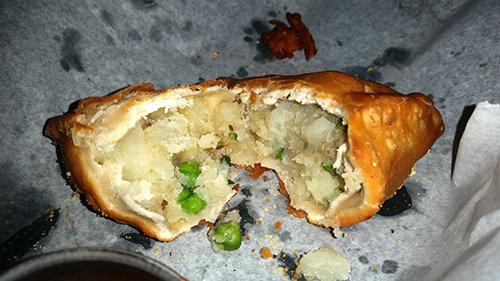 The crisp triangular samosa was filled with mashed potatoes, peas and spices including cilantro…which was fantastic. 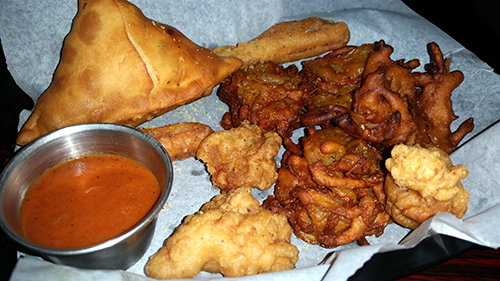 The vegetable pakora (fried fritter) had a tasty collection of julienned veggies and was bound by an extraordinary batter which really made the onion pakora sing. If you picture good cornbread with a crispy crust and sweet onions running through, you are getting close. 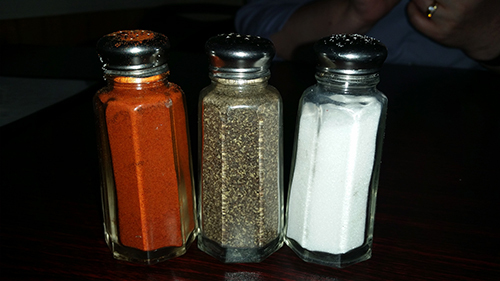 The additional spices are what make it unique. The last of the five was panner pakora, a housemade cheese which is very dense (like haloumi) and salty beneath the lightly spiced crust. All were served with a little cup of reddish orange sauce which looked like it would be seriously spicy but had more of a vinegar bite with a little heat and vegetable flavors. So good. Mash & Peas, Why Wouldn't Ya Fry That? There are three bread options. A Roti – wheat bread cooked in a hot pan. 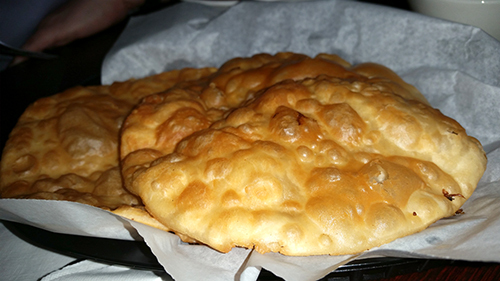 Poori – lightly fried whole wheat bread. Shatura – a crispy layered fried bread which was recommended and wonderful. I don’t imagine the name is associated with the shattering effect of the crunchy outer layers that give way to a warm and forgiving doughy interior, but if so it is well named. Since there was no mutton momo, I learned there was a pork momo (not on the menu) and was delivered gorgeous and meticulously crafted steamed dumplings. The ground pork interior is lightly flavored but enough to make the clean and juicy pork shine. There was another little cup of tasty sauce and a bowl of something. Still not sure what the content of the bowl was, what it was for, if the three ways I tried to incorporate it with the dumplings were even close. Next time I will have to ask. Steph ordered Chicken Matar which was just stupendous. I want to swim in this stuff. Seems very tomato based but with a unique spice including cinnamon, ginger, and I couldn’t tell you what else. Doesn’t matter. It’s delectable. 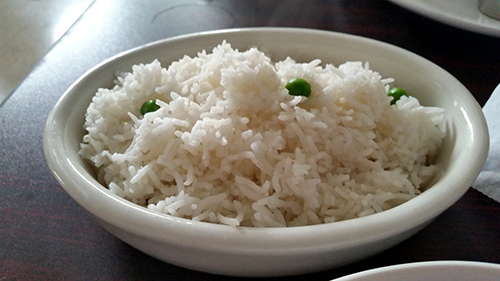 A bowl of fluffy rice with a few peas hanging out comes alongside and I learned I straight up love this hand made and passionate Nepali food. You should go. I’ll be going again. MMMmmmmmm, Mutton Matar. Can’t wait.